It's Pub Night is usually written in past tense, as a diary of what I've been up to, since other Portland bloggers cover the event calendar much better than I could. But there's one event that I love so much that I want to give you a quick heads up about it: the Lucky Lab hop harvest party. 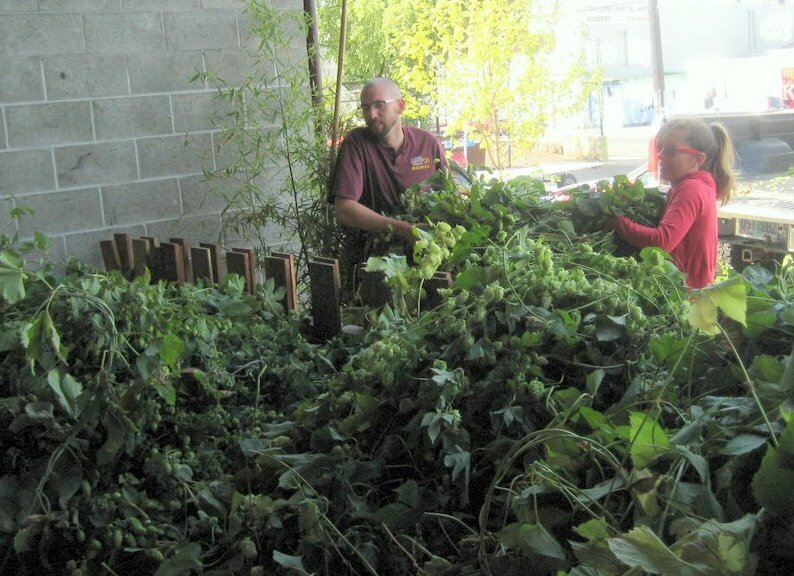 Next Thursday, September 2nd, the back patio of the Hawthorne Lucky Lab will be filled with homegrown hop vines brought in by anyone who cares to contribute to the Lab's fresh-hop seasonals this year. At 3 PM, an informal hop-picking session begins -- whoever drops in can just grab some vines and start picking off the hops. Free beer, lupulin aromatherapy, jovial company, and the satisfaction of a job well done are your payment. Most of the work will probably be done by about 7 PM, at which time some grilled snacks will be served. It's a very special experience that I highly recommend. You'll see lots of the usual Portland beer geeks -- an alarming number of whom now write blogs -- as well as stalwart Lucky Lab regulars. But -- I swear I see this happen every year -- there will also be people who just happen in to the pub for the first time, see what's going on, and dive right in. That, friends, is Beervana. To get a flavor of it, check out my slide show from last year, or Angelo's excellent recap. If you have hops growing at home and aren't going to use them in your own brew, bring 'em on down, even if you can't stay to pick. While I'm writing in the future tense, another chance to drink free Lucky Lab beer is coming up September 11th: the Tour de Lab bike tour. I guess it's not really free beer, since you pay $35 to register, but the proceeds benefit Dove Lewis veterinary hospital. I've not gone on the ride before, but since I was offered a free pass, I'm going to brave the 30-mile loop hitting all four Lucky Lab pubs with my neighbor Lindsey (there is also a less hilly 18-mile route that skips the Multnomah pub). While I'm writing about the future, bikes, and beer, don't forget that Hopworks BikeToBeerFest is tomorrow, and is also a really excellent time. Here are my thoroughly-researched ideas on the best bike approaches to Hopworks (especially useful if you're in a big group or biking with kids or novices). I have a friend who has 10 plants of Spalt (!). I have alerted him to the Lab shucking.